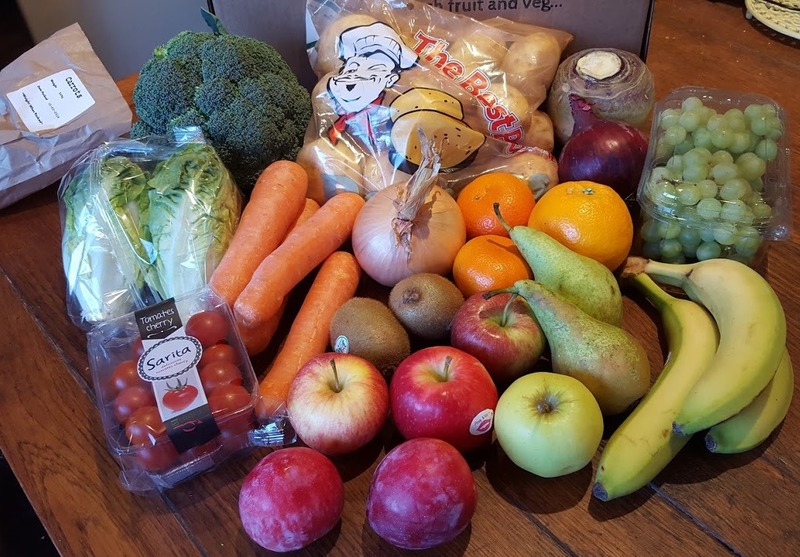 The Brick Castle: Creamline Fresh Fruit And Veg Box Delivery Review (NorthWest UK). Creamline Fresh Fruit And Veg Box Delivery Review (NorthWest UK). Back in our parents' childhood the milkman delivered your fresh pint every day and kept an eye on the neighbourhood while most of us were still asleep. 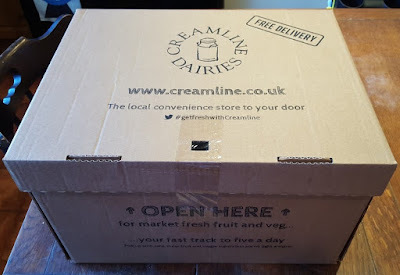 Creamline Dairies is a family owned business with a network of affiliated independent milk round operators which has been operating in Manchester and the North West for over 60 years. 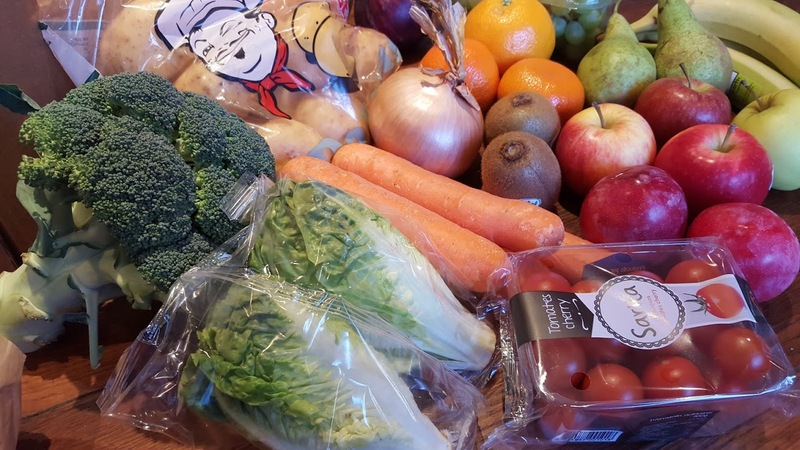 Creamline Dairies also sell a huge range of groceries, including fresh fruit and vegetables which they pick up fresh each day at New Smithfield Market in Manchester, and they have sent me a box of their fresh produce to review. Fresh foods from local markets selling local produce means you get food which has travelled less distance. You are supporting local people who in turn put a lot of that money back into your local area, and free home delivery makes it accessible to everyone. My local Creamline Milkman is a lovely bloke who delivers twice a day, milk in the early hours and groceries in the mid-morning, so my box was with me around 10.30am. Deliveries can be earlier, and you don't have to be home (or awake!) to receive your box. I didn't choose my own review box contents, but it was actually very close to what I buy each week. I generally buy from a supermarket, and it is very clear to see that the produce I got is less bruised and bashed than I am used to. It is fresher and (if it gets the chance) will last a lot longer. Because it's fresher it has a higher vitamin content, and is tastier. From the moment it's picked, the sugars in fruit and veg begin turning to starch, so if you want sweeter root vegetables, tomatoes and fruits, the fresher the better. Obviously you can only get local produce when it's in season, so while my potatoes are from 5 miles away, my tomatoes have travelled a fair distance as it's March. We have still cut out all of the time sat in warehouses or being driven around the country though, and it shows. I ate the plum straightaway, and it was as good as it looked. I was also delighted to see tasty genuine carrots that aren't glowing orange, scrubbed and pre-frozen, and broccoli so fresh cut that I can't imagine it had been out of the field very long. Creamline prices are in general a little more than your supermarket, but you pay for what you get. I cut my broccoli in half and used a portion a week later and it was still a great thing. My remaining carrot looked exactly the same 2 weeks later, as did the leftover potatoes, yet my supermarket potatoes I bought the day before have started to wrinkle, and did not make crispy roast spuds yesterday. Creamline let you choose every item in your veg box, so you set your own budget and you can meal plan effectively. 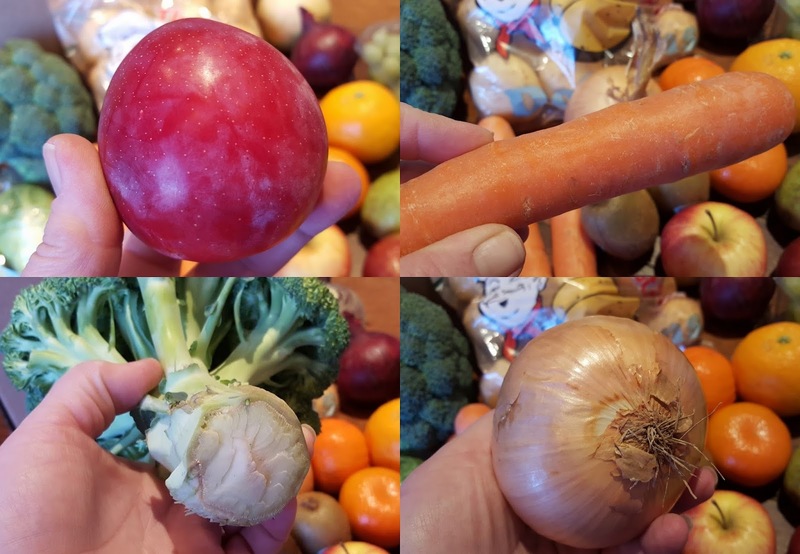 Because your produce isn't going to wilt after 3 days, you shouldn't have to throw any away and with free delivery on a minimum order of £10, you won't get carried away buying 3 for 2 offers you won't have chance to use, so you shouldn't find you waste either food or money. This type of buying is especially useful for single people and couples, or anyone who has no need for a 25kg bag of spuds, or bag of 12 oranges. Bulk is not a bonus, but choice and variety is - with over 60 varieties of fruit and veg on offer. We found everything was superb quality. 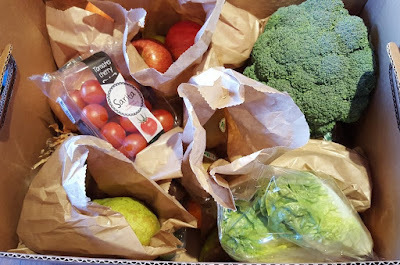 I was especially impressed with the care taken over my softer goods, and everything except the grapes, lettuce, tomatoes and potatoes was wrapped in recyclable paper packaging - no unnecessary trays of apples or plastic bagged veg. Creamline deliver groceries to the Northwest England area around Manchester. To find out more take a look at the Creamline Home Delivery Veg Box page on their website. I love getting local fruit and veg and wish we had a market nearer. I used to get lots from my milkman till he stopped coming as he was the only one who came out in all weathers! Love this idea of fresh veg to your door. Save so much time! It certainly does - I'd never have chance to go to the market!